Want huge arms? Try this intense 45min Killer Arm Workout! What guy doesn’t want big arms? Shirt-busting guns that women both notice and admire. We’ve all seen guys pumping out countless curls in front of the mirror to make their arms grow, but is that the best way to get killer guns? Or are they just wasting their effort and time by not following a strategic arm workout that will really maximise muscle growth? It’s vital to know what arm exercises are most effective in building your arm muscles, and ensure they are performed correctly. Below is an intense 45min arm workout to help you achieve killer guns. 1. Stand with feet roughly shoulder width apart and hold a straight bar with your hands an equal distance apart. Don’t extend your arms fully, have them about 1/5 short of full extension. 2. With only a small amount of hip movement, curl the weight up to your chin, keeping your elbows in the same place at all times. 3. Bring the weight back down to your sides through the same range of motion as it was curled in. 1. Stand with your feet shoulder width apart, keeping your back straight and core stable at all times. 2. 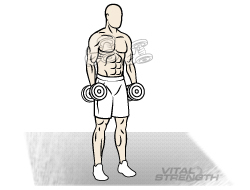 Holding the dumbbells parallel to your body, curl them up to a right angle position, keeping your thumbs facing towards each other as if you were holding a hammer, and then lower back down beside your body. 3. Remember to squeeze your biceps as you reach the top of each rep.
1. Sit on a flat bench with your legs apart, knees bent and feet on the floor. 2. Holding the dumbbell in front of you between your legs, rest your elbow on your inner thigh and curl the dumbbell up towards your shoulder. Remember to keep the elbow in place at all times. 3. At the same pace, bring the weight back down and return to your starting position. 1. 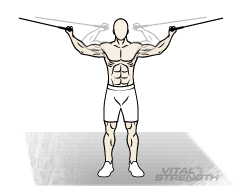 Standing between both sides of a cable pulley machine, grab each handle with an underhand grip (palms facing towards the ceiling). 2. Your arms should be fully extended and parallel to the floor with your feet positioned shoulder width apart. 3. Slowly squeeze the biceps on each side until your forearms and biceps touch. Then return to the starting position. 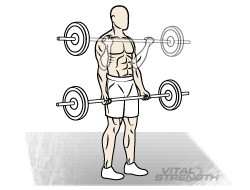 Note: Your entire body is stationary during this exercise except for the forearms. Tip: Perform this arm workout with 1min 30sec rest in between sets and remember to focus all your attention on your bicep muscles and in particular the contraction and extension. 1. Lying on a flat bench with feet planted securely on the ground, extend arms above your face and hold the ezy bar in a narrow grip. 2. Keep your elbows in position and arms stable, lower the bar until it reaches your forehead or just past your hairline. Hinge only from the elbow, not the shoulder. 3. Focus on your elbows, engage your triceps and extend the bar back to the starting position. *Tip: Once you reach the top of each rep, don’t fully lock your elbows out, keep the tension on the muscle by stopping just short of lock out. You should always feel your triceps working on the eccentric and concentric part of the movement. In fact, this rule should apply to any tricep exercise! 1. Stand with your feet shoulder width apart, lean slightly forward and place your elbows a little forward. 2. Keep your elbows in position and pushdown on the bar with your triceps, without changing your elbow angles and until your triceps are fully extended and flexed. 3. Control and release the movement back up to the starting position – resist and don’t just let go completely! *Tip: On the concentric part of the movement, place your knuckles down and hold for 1 second then slowly release up. – Think “squeeze”! 1. 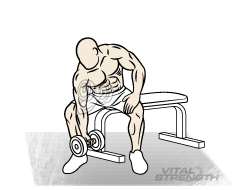 Sit on a flat bench or rest your back on a bar of a bench press. Grab a DB and place your hands like a star for grip above your head. 2. Start with your arms in a straight position and release with you arms while keeping your elbows in place keeping the DB close to your body. – focus on your triceps lowering. 3. Once you reach back as far as you can, squeeze your triceps and return back to the starting position – control this movement back up. *Tip: Elbows can come a little like a V at the bottom on the movement. 1. Start with your hands either side of you suspended on the bars. 2. Lower yourself slowly into the bars, while keeping your elbows inline of your body – more narrow, more tricep. 3. Once you’ve reached as far as you can go, then push out of the movement using only your triceps without engaging your chest. *Tip: Position your body and hands a little narrower then usual on the bar, tuck your chin in slightly and look down. 1. Stand infront of a smith machine with the bar inline or just below your chest place your hands in a narrow grip similar to ezy bar skullcrushers. The more upright you stand the easier the load and the more lower and closer you stand the harder the arms will have to work. 2. Slowly lower yourself to the bar so your head reaches the bar, or you can stretch even further so the bar is behind your head. 3. Once fully stretch push-away from the bar to your starting position – keep your elbows inline the whole time! 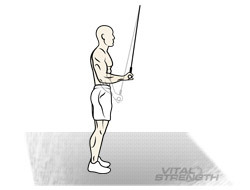 *Tip: Focus and control the triceps through this whole movement. Slowly lower yourself past the bar, hold the stretch don’t switch of your triceps at all, then think pushing and squeezing away with only your triceps – Do not rush this movement at all. To maximise results, be sure to refuel your muscles with Vitalstrength Hydroxy Ripped Thermogenic Protein within 30mins of your workout. 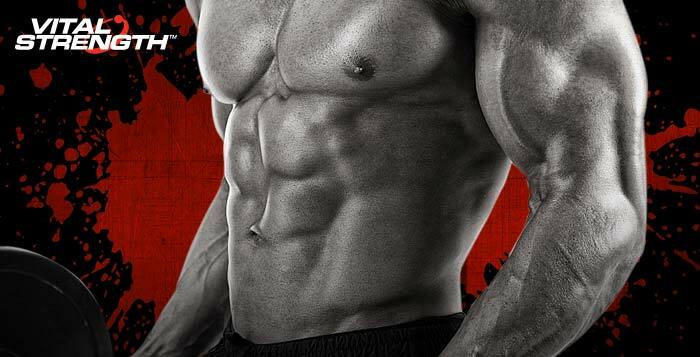 Designed to get you lean and ripped, Vitalstrength Hydroxy Ripped delivers high protein plus clinically proven fat burners to build strong, lean muscle faster.